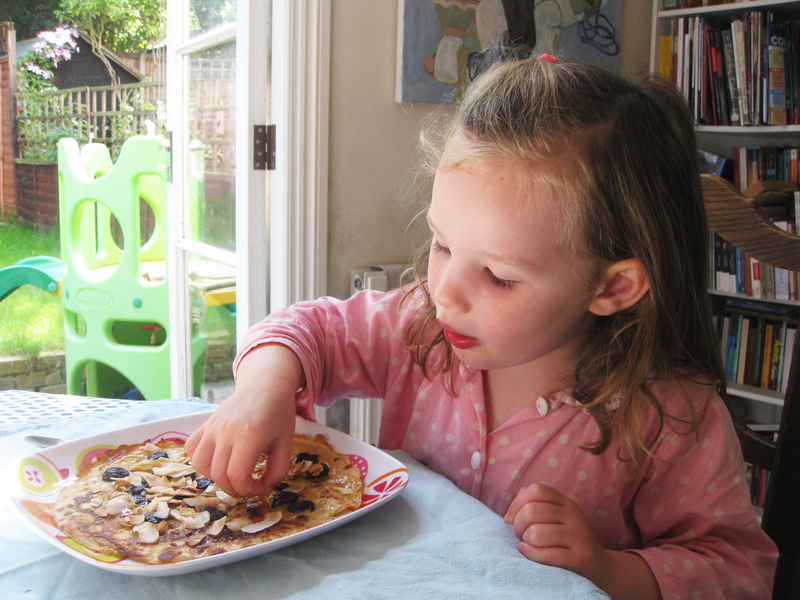 Zoe’s favourite part of the kitchen is the cupboard where the dried fruit and nuts are stored (unless there’s some cake or cupcakes in the kitchen, in which case her focus switches immediately…) Her favourites at the moment are dried cherries and coconut so when she wanted to make pancakes, she pulled those out of the cupboard. 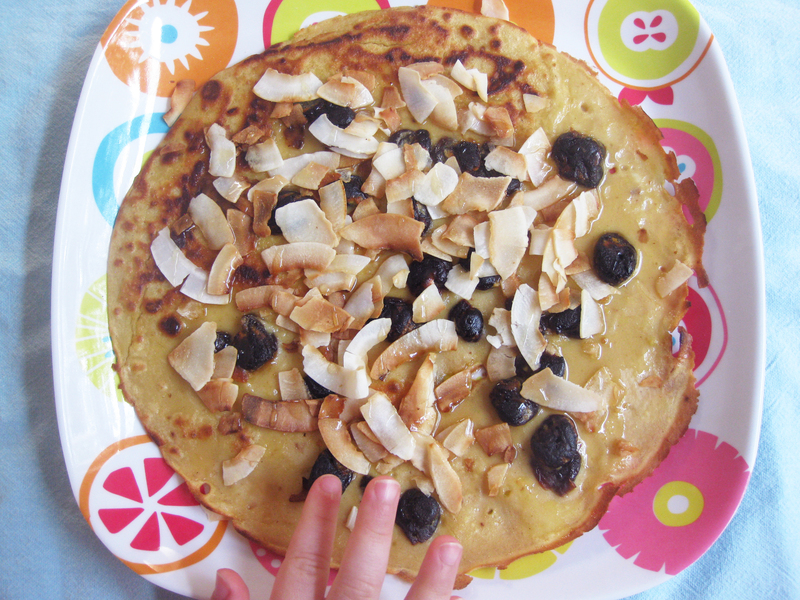 We soaked the cherries for a little while and toasted the coconut, but if you’re in a rush, you don’t need to do that. When they were made, we drizzled honey over the pancakes – mountain honey that we’d brought back from Thollon, France – delicious! Put the dried cherries in a bowl and pour the soya milk over. Leave to soak for as long as you can – up to 30 minutes. Strain through a seive into a bowl and leave to one side, and reserve the soya milk. 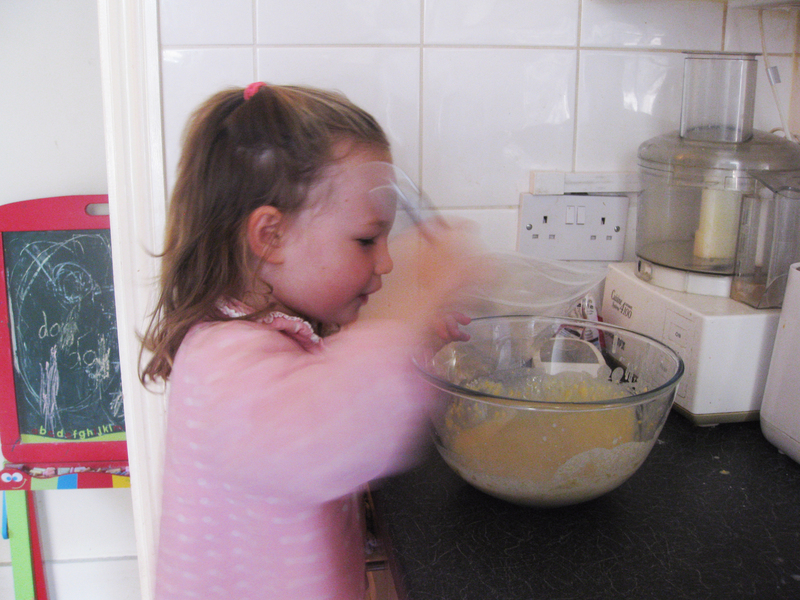 Beat the eggs in a large mixing bowl, then sift in the flours, gluten-free baking powder and salt and stir together. Slowly beat in the soya milk, gradually drawing in the flours to make a smooth batter. Cover and leave to stand for at least 10 minutes at room temperature or up to 30 minutes in the fridge. Meanwhile, heat a large non-stick frying pan over a medium heat until hot. Add the coconut flakes and dry-fry, stirring continuously, for 2–3 minutes until just beginning to brown. Remove from the pan and leave to one side. Add a little of the dairy-free margarine to the pan and heat until melted, making sure it covers the base of the pan. Using a small cup, pour a cup of the batter into the pan to form a circle. Sprinkle a small handful of the cherries over the top, distributing them evenly, and cook for 2–3 minutes or until the base of the pancake is golden. Using a large spatula, flip it over and cook for another 1–2 minutes until golden. Repeat with the remaining batter to make 4–6 pancakes, melting more margarine in the pan as needed and adding a little more soya milk if the batter seems too thick. Stack the pancakes between sheets of baking parchment to prevent them from sticking together and to keep them warm. Scatter coconut flakes over the top, drizzle with honey and serve hot. 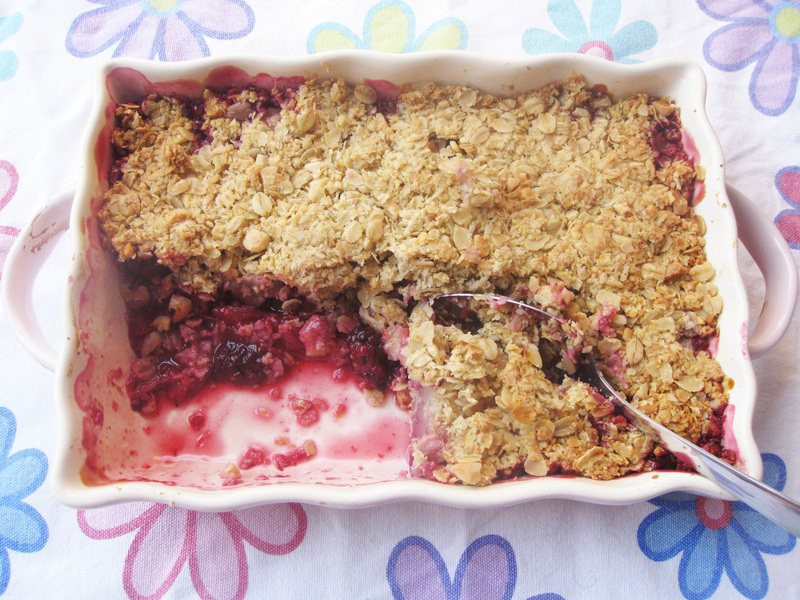 This delicious crumble is made with gluten-free oats. Recently it was discovered that oats don’t actually contain gluten – but because they are generally produced and packaged alongside other gluten products, especially wheat, they often have a certain amount of gluten in them. Great news! I’ve always loved oats but have definitely experienced reactions from them in the past. But Coeliac UK have confirmed that oats are naturally gluten-free, within their parameters of less than 2 parts in 1 million (although not all organizations agree). For me, the gluten-free oats you can now get are definitely ok, and I don’t get any reactions. My favourites are made by Nairns and you can find them in most supermarkets and health stores. Preheat the oven to 180ºC/350ºF/Gas 4. Put the apples and blackberries in a shallow baking dish and sprinkle with the lemon zest and juice. Drizzle over the honey and apple juice. Mix together the hazelnuts, oats, oil and apple juice, then spoon the mixture over the fruit and press down gently. Bake for 30 minutes until golden brown, then serve. Zoe loves nori which is great because it’s amazingly good for you. Like other sea vegetables, it is high in B vitamins, beta-carotene, calcium, iron and zinc, so it is brilliant at boosting your immune system. And it’s particularly high in vitamin A which helps prevent colds and sore throats, as well as maintaining healthy skin. She’ll eat the sheets of nori by themselves (and I’m inwardly cheering as she nibbles all those fantastic nutrients!) and is particularly keen on having it as sushi, especially with this avocado/mayonnaise filling. I used to make sushi the more standard way, by rolling the nori over the filling and then cutting each roll into pieces. But then Renée Elliott showed me how easy hand rolls are to make – in fact, you can put all the ingredients on the table and let everyone (kids included) make their own rolls. This recipe is adapted from Renée’s latest book, Me, You & the Kids, Too – you can use any combination of veggies – we used the cucumber and carrots we had in the fridge this time (and added extra avocado), instead of the asparagus, sprouts and beetroot in Renée’s recipe. The additional bonus about this recipe (like all the recipes in Me, You & the Kids Too) is that you can also make nutrient-dense purées for your baby, from this recipe. There’s no need for additional ingredients, you just take from the main amount. And bingo – a meal that feeds all. However, as Zoe told me this morning (on her first day at nursery/school), she’s not my baby any longer. So no more purées for her… Sob! Put the rice and 455ml/16fl oz/scant 2 cups water in a saucepan and bring to the boil over a high heat. Turn the heat down to low and simmer, covered, for 40 minutes until the rice is just cooked but still retains a slight bite. Put the asparagus and green beans in a steamer and steam, covered, for 5 minutes until the vegetables are cooked but still slightly crunchy. Add the salt to the cooked brown sushi rice and mix well. To make the sauce, mix together the avocados and mayonnaise in a bowl until smooth. To make a hand roll, spread 1 tablespoon of the sauce diagonally down the centre of one nori sheet, then add a little wasabi on top, if using. Put 1 tablespoon of the cooked brown sushi rice, 1 piece of asparagus, 2 green beans and 1 tablespoon each of the beetroot and sprouts, if using, on top of the sauce. 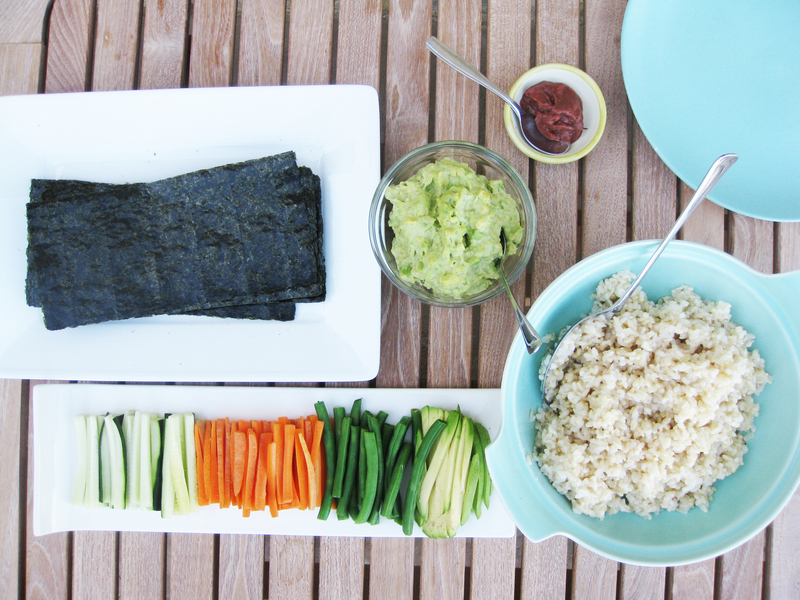 Take the nori sheet in your hand and roll into a cone shape. Repeat with the remaining ingredients and serve. Put 4 tablespoons of the cooked brown sushi rice and 135ml/4½fl oz/generous ½ cup boiling water in a saucepan and simmer, covered, over a low heat for 10 minutes. Add 4 green beans and cook, covered, for a further 10 minutes until completely soft. Transfer to a blender and add 2 tablespoons of the avocado and 3 tablespoons water. Blend for 30 seconds, adding extra water 1 teaspoon at a time, until smooth. Serve warm. Put 4 tablespoons of the cooked brown sushi rice and 135ml/4½fl oz/generous ½ cup boiling water in a saucepan and simmer, covered, over a low heat for 10 minutes. Add 2 green beans and 1 asparagus piece and cook for a further 10 minutes until completely soft. Transfer to a blender and add 2 tablespoons of the avocado, 1 tablespoon each of the beetroot and sprouts, if using, and 3 tablespoons water. Pulse for 15 seconds, adding extra water 1 teaspoon at a time, until the mixture forms a lumpy purée. Serve warm. Most people think of buckwheat pancakes when they think of buckwheat – made with buckwheat flour. But the grain itself (totally gluten-free) is a fantastic addition to your storecupboard. It is highly nutritious (full of magnesium, B-vitamins, rutin which helps circulation and all eight essential amino acids) and in particular it’s great in terms of your blood-sugar balance. Don’t be put off by the nutty taste of buckwheat, though. As this recipe shows, it can be delicious if you mix it with strong, fresh flavours. Here I’ve added sweet roasted veggies, and fresh, tangy lemon and mint. Serve this as a main course, with a salad, for a delicious dinner – and it makes a brilliant meal for your lunchbox, too. Preheat the oven to 180°C/350°F/Gas 4. 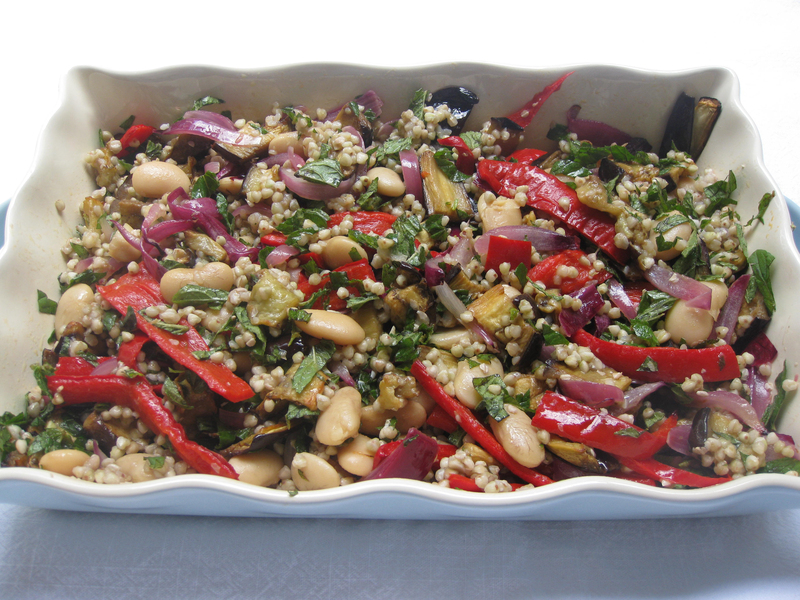 Put the aubergine and peppers onto 3 separate baking trays and drizzle 2½ tablespoons of oil over. Bake for 10 minutes, then add the onion and drizzle ½ tablespoon of oil over. Bake for a further 10 minutes until tender and slightly browned. Remove from the oven and transfer to a large serving dish. Meanwhile, wash the buckwheat thoroughly, put in a saucepan and pour over 400ml/14fl oz/scant 1⅔ cups cold water. Bring to the boil over a high heat then turn the heat down to low and leave to simmer for about 6 minutes until softened, scimming off the scum with a flat metal spoon. Remove the pan from the heat and leave to stand for 10–15 minutes until all the water has been absorbed and the buckwheat is soft, but not mushy. Rinse thoroughly with boiling water and transfer to the serving dish with the roasted vegetables. In a small jug, mix together the lemon juice and the remaining 3 tablespoons of oil and season lightly. Add the butter beans to the serving dish and pour over the dressing. Mix thoroughly, then add the mint leaves and mix gently. Serve either warm or cold.